LOW NOx technology for solar thermal power plants. Within the field of renewable energies, E & M Combustion has developed an intense work in R&D&I and already has an important presence in the sector of solar thermal plants, in which Spain is one of the pioneering countries in this type of technologies. E & M Combustion has participated in the development of plants that combine the technology of tower and field of heliostats, such as the solar plant PS 20 of Sanlúcar la Mayor (second central plant in the world with this type of technology), as well as in the development of plants with HTF technology. Its participation in the project of the solar plant PS 20 has led him to develop low nox technology, throw a specific burner to work with LNG of 50 MW and with NOx emissions lower than 100 mg / Nm3 and a wide range of modulation of 1:25, what allows to have a great precision in the control of the steam pressure of the installation. The new designs of the JBD-4000 G burner are installed in the Solacor I and II, Helios I and II and Solaben II, II, III and VI plants. E & M Combustion bet from its inception for the development of burners with the lowest possible emissions, while also betting on their participation in R & D projects, especially in the field of renewable energy as an alternative means of electricity production. 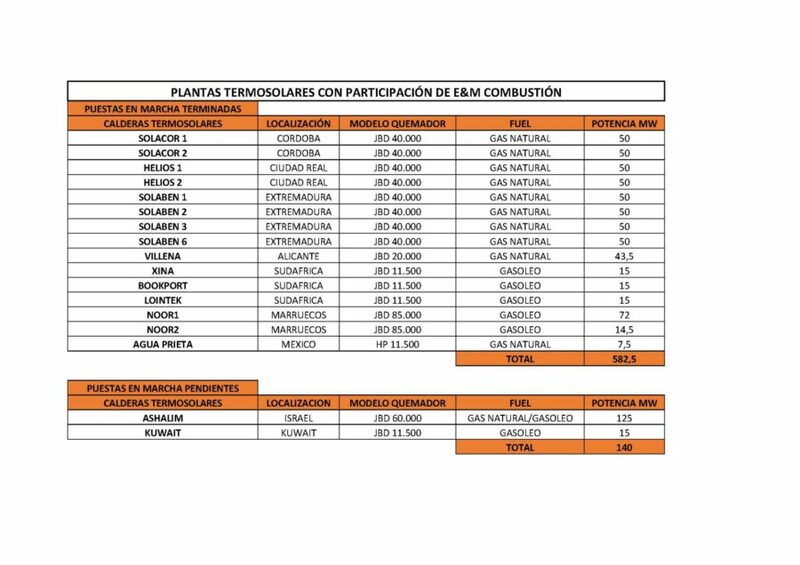 Overall, E & M Combustion has participated to date in a total of 17 solar thermal plants in places such as South Africa, Morocco, Mexico, Israel, Kuwait and Spain. The installed power by the company is 582.5 MW, pending to start up another 140 MW, which correspond to the thermal power plants of Ashalim, Israel, and Kuwait. E&M Combustion is a company created in 2004, located in the Spanish town of Artea. It specializes in the design and manufacture of industrial burners and combustion equipment using innovative technologies that allow low pollutant emissions. The equipment is designed and manufactured adapting to the requirements of its customers’ plants and to reduce the use of energy. The company operates mainly in the energy sectors, power generation, petrochemical and refinery, biomass and part of the food sector. E & M Combustion is present in more than 30 countries and allocates more than 70% of its production to export.